Blobby Farm | The Newbraska Picayune | Book Review: Slide Already! One of my children fell in love with Slide Already! when he was just 18 months old and it has kept him engaged for years. It is a simple story. The book is hardbound, but with a soft, squishy cover that is a pleasant texture to handle. The pages are stiff and substantial to resist damage from tiny hands. Kit Allen’s childlike illustrations and plain writing are simple enough for younger children, but expressive enough to keep older children engaged. Hey, what is this thing? A big metal chair? This unpretentious narrative begins with very casual story-telling. 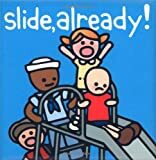 It doesn’t have the stilted feeling of more academic writing, but reflects the sensibilities of a playful adult postulating on a child’s innocent first reaction to a slide (the give-away is the metal slide—a relic compared to post-1990 plastic playgrounds). At first blush, the child—akin to an early Fisher-Price figure or a slender Charlie Brown—mistakes the slide for a “big metal chair” in which he comfortably reclines. He is woken from his reverie by a gaggle of friends resembling Our Gang lead by a bossy tomboy. It is this tomboy who brusquely informs him, “That’s not for relaxation! That thing is for action!” She goads him into climbing the ladder and summiting the slide. This portion of the book features some delightful repetition that encourages parroting by children. From the stuttering “m-m-m..muh…muh..me?” to the escalating “oh no oh no oh no” to the crescendo chant of “Slide!” children’s excitement mounts and they chant right along. It’s also a great opportunity to introduce children to letter sounds and recognizing simple words. A spectrum of emotion, including boredom, fear, trepidation, terror, relief, excitement, and elation rises and falls just like the act of climbing and sliding. Where the book really comes to life is on the actual playground where my child has reenacted the story as he climbs to the top of the slide and recites lines from the story while I goad him into braving the plummet into my open arms. Not only has he learned some basic reading skills, but he has learned to empathize, emote, and muster up his courage to conquer fear.